I’m a fifth-generation Idahoan, whose maternal grandparents were ranchers in Owyhee County, Idaho, at the turn of the twentieth century. I’m working on a biography of Kittie Wilkins, the Horse Queen of Idaho (1857-1936), with whom my great-grandparents were acquainted. According to the newspapers, Wilkins made the largest sale of horses in the American West when she sold 8,000 head for the British Army Remount Department’s US Commission to send to the South African War, 1899-1902. Idaho Public Television featured Wilkins in the documentary “Taking the Reins” in its new series Idaho Experience. I’m therefore also currently researching the supply of war horses and army mules from America to the South African War, which I call the Equine Middle Passage of the transatlantic horse trade. Powder Face, the Horse That Robbed the Winnemucca Bank! One of Wilkins’s horses, an Arabian, called Powder Face, was stolen by the Wild Bunch to use in their getaway from their robbery of the First National Bank in Winnemucca, Nevada, on September 19, 1900. During the getaway, Butch Cassidy gave Powder Face to a 10-year-old boy in Winnemucca. Powder Face is therefore at the center of the legend of Cassidy as America’s Robin Hood, who stole from rich and gave to the poor, liked children, and was kind to animals. The Wild Bunch. John Swartz (1858-1930). 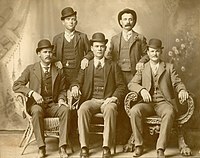 This image is known as the “Fort Worth Five Photograph.” Front row left to right: Harry A. Longabaugh, alias the Sundance Kid, Ben Kilpatrick, alias the Tall Texan, Robert Leroy Parker, alias Butch Cassidy; Standing: Will Carver & Harvey Logan, alias Kid Curry; Fort Worth, Texas, 1900. In Stavanger, Norway, last September 25-27, 2018, I presented the paper “Moving Horses: War Horses from the American West to the South African War, 1899-1902” at the “Horses, moving” Conference at the Arkeologisk museum, Universitetet i Stavanger. Also in London next April 25-27, 2019, I’ll present the paper “‘Far from Good Sailors’: American Horses and Mules for the Anglo-Boer War in South Africa, 1899-1902—An Equine Middle Passage of the Transatlantic Horse Trade” at the “Maritime Animals: Telling Stories of Animals at Sea” Two-Day International Conference at the National Maritime Museum. #MemberMonday profiles the current activities of Equine History Collective Members. If you would like to be included, please contact us: equinehistory@gmail.com!